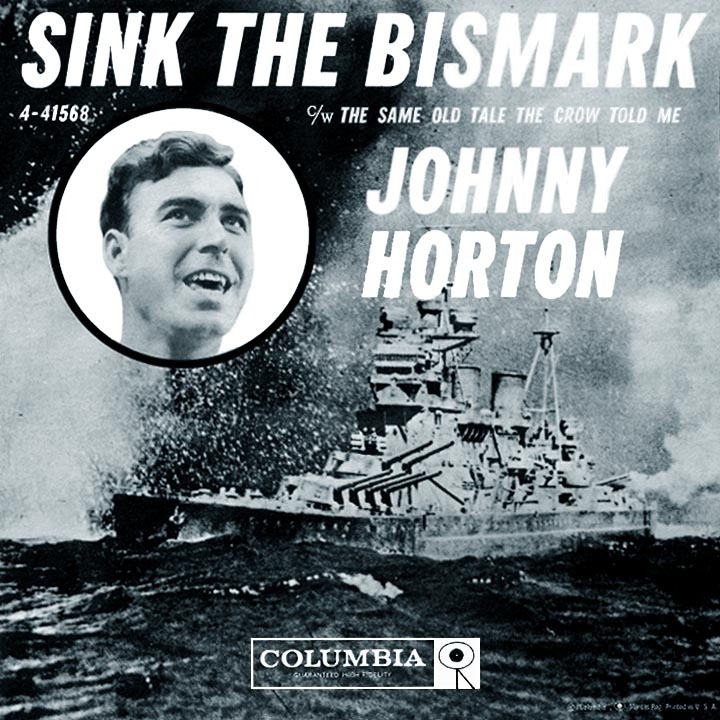 Johnny Horton is best remembered for historical songs about the War of 1812, the Civil War, the late-19th century Alaskan gold rush and World War II. But when he started out he was just a plain ol' country singer more interested in fishing and hunting than just about anything else. Born in Los Angeles, had he stayed there I probably wouldn't be writing about him now. But as it turns out, his family traveled back and forth between Texas and California, taking jobs picking cotton or fruit, giving Johnny a decidedly rural outlook and love of the outdoors. After high school he considered the ministry and a basketball career and was later employed in the mailroom of Selznick International Pictures (where he met his first wife, Donna Cook, who worked in the movie studio's office). In 1949 he moved to Alaska and took a job as a fisherman. But this young man couldn't sit still for long. When he returned to the 48 states, he began following a music career. He started entering talent competitions, winning one hosted by disc jockey Jim Reeves (before his own successful singing career) in Henderson, Texas, where Johnny had spent time as a child. Further exposure through other contests led to a TV gig in 1950 with Cliffie Stone on his Hometown Jamboree show broadcast on KLAC-TV ("Lucky 13") in Los Angeles and his own radio show on KXLA in Pasadena as The Singing Fisherman. He made his first records in 1951 for a small label, Cormac, the first being a tune called "Plaid and Calico." The Cormac recordings were pretty standard stuff, but more live bookings came as a result for Horton and his backing band The Rowley Trio, later known as Johnny Horton and the Roadrunners. When Cormac closed up shop, his manager, Fabor Robison, started Abbott Records and put out a hot hillbilly tune by Johnny, "Rhythm in My Baby's Walk," though it was Reeves who gave Abbott its first hit with country chart-topper "Mexican Joe" in the spring of '53. Johnny began peforming on the syndicated Louisiana Hayride radio show, based in Shreveport, around the time he got his Abbott contract, staying with the show long enough to cross paths with Elvis Presley in '54. Divorced from Donna by that time, he had married Billie Jean Jones in September 1953; she was the widow of the great Hank Williams, who had died in the back seat of a car on January 1 of that year after a little more than two months of marriage. The Horton union would last much longer than that, but with an eerily similar end. 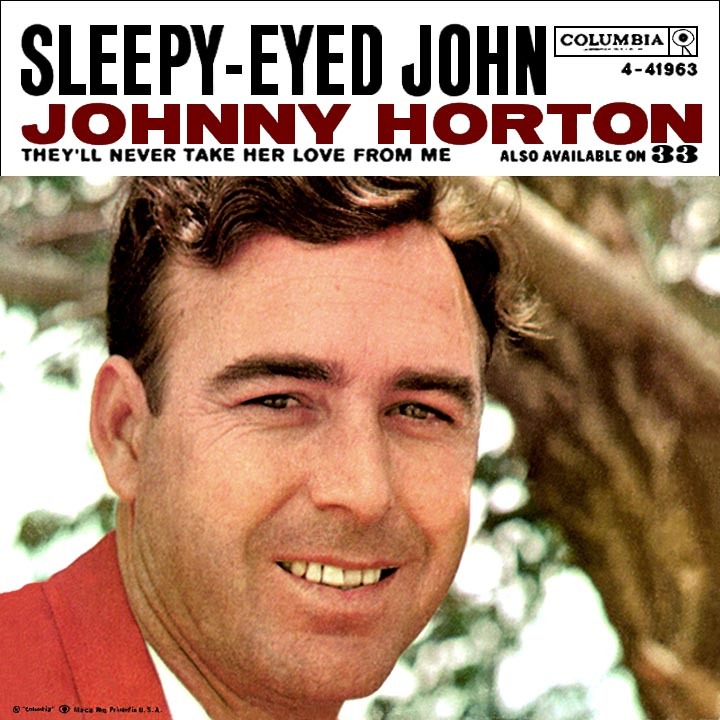 Johnny settled in Shreveport when he joined the Hayride and later released a dozen singles on Mercury Records including "All For the Love of a Girl," yet none achieved anything more than regional popularity. When he split from Mercury and manager Robinson, Horton's career took a major turn for the better. Musician-manager Tillman Franks of Shreveport had taken the career of Webb Pierce to great heights (Pierce had scored several number one country hits by the mid-'50s) and Johnny leaped at the chance to sign with him. Within months he was on the roster of one of the biggest record companies, Columbia. Howard Hausey (better known as Howard Crockett, a future Motown act!) had written "Honky-Tonk Man," and during the time Johnny spent around Elvis, something must have rubbed off. The session (with Presley bassist Bill Black sitting in) had more of a rock and roll feel than anything he'd done previously, and in spite of radio's skepticism regarding the hybrid style, the song hit the country charts in May, coming close to the top ten the following month. The Franks and Horton-penned follow-up, "I'm a One-Woman Man," was recorded at the same session with an identical arrangement and went top ten C&W in the fall. The Singing Fisherman had made it; he was a full-fledged hit-making country singer! "I'm Coming Home" and "The Woman I Need" were fair-sized hits the following year, but walking a line between country and rock (and dabbling in the teen sound with "All Grown Up" in '58) seemed to keep him in a middle zone, unable to climb any higher in the country field. In 1959, a change of subject matter sent him to the top as a country act while also breaking him through to the mainstream. 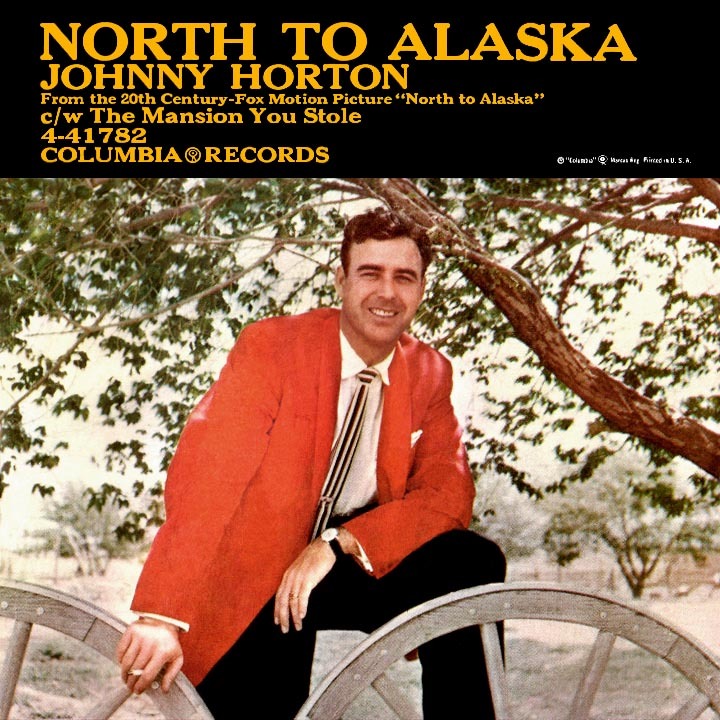 Franks came up with a song Johnny Horton could relate to, having spent at least one lengthy stretch fishing in the frozen north. "When It's Springtime in Alaska (It's Forty Below)," which name-dropped locations like Point Barrow, Fairbanks and Kodiak against a love triangle that doesn't end well for the singer in a place called the Red Dog Saloon, he struck gold (but didn't have to mine for it). The song hit number one on the country charts at the end of March 1959; it didn't hurt that Alaska had become the 49th state on January 3 and was a hot topic of conversation at the time of the single's release. Many involved felt they'd reached the pinnacle, but Johnny expected more - he wanted a big crossover pop hit. And he got it with the next record, a humorous, banjo-pickin' retelling of a historical conflict. The final battle of the War of 1812 occurred on January 8, 1815 when future U.S. president Andrew "Old Hickory" Jackson and his troops defeated British opposition in New Orleans. Shortly afterwards, an instrumental tune commemorating the event, "The Eighth of January," was popular. 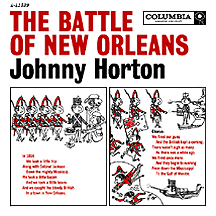 Jimmy Driftwood added lyrics to the song in 1958, giving it the obvious title "The Battle of New Orleans." 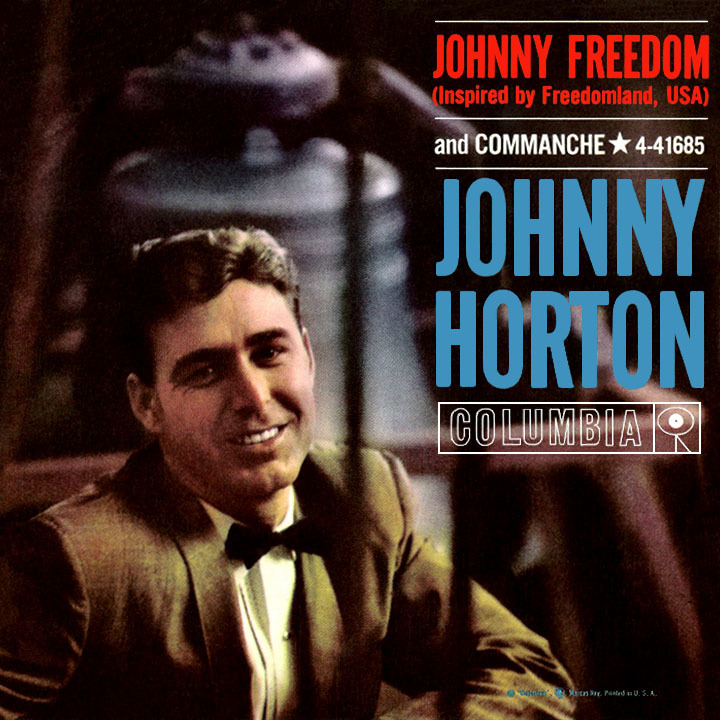 Horton's version became a runaway smash, holding number one on the pop and country charts from May to July 1959, one of the year's biggest hits, ultimately winning two Grammys: one for Best Country and Western Performance and the other to Driftwood for Song of the Year. Follow-up "Sal's Got a Sugar Lip," another Driftwood song, took a lighter approach than earlier releases, then came a series of history-based "saga" songs. Merle Kilgore's "Johnny Reb" told of the everyman Confederate soldier fighting on the losing side of the Civil War. 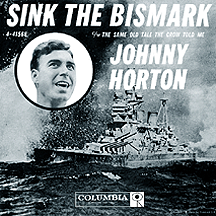 The 1941 sinking of the German battleship Bismarck by Britain's Royal Navy during World War II was recounted in "Sink the Bismark" (the song's title inexplicably misspelling the ship's name). Released at the same time as the movie Sink the Bismarck! starring Kenneth More and Dana Wynter, the tie-in worked to the advantage of both film and song, and Horton was back in the top ten in April 1960. 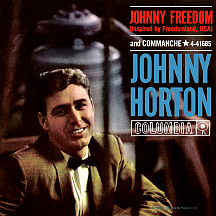 The success of those folksy history-based songs resulted in several derivative efforts in '59 and '60, including a reference to Napoleon Bonaparte in the summer '59 hit "Waterloo" by singer Stonewall Jackson (a descendant of the famous Confederate general of the same name), released by Columbia with a picture sleeve similar to Horton's cartoony "Battle of N.O." cover. Homer and Jethro's parody "The Battle of Kookamonga" reduced the New Orleans conflict to the level of scout camp pranksters, and in the October 1960 chart-topping hit "Mr. Custer," Larry Verne reminisced about the arrows he claimed to have dodged at the Battle of Little Bighorn. Marty Robbins and Bud and Travis had competing versions that fall of "The Ballad of the Alamo," tied to the release of the John Wayne-directed blockbuster The Alamo, starring Wayne, Richard Widmark and Frankie Avalon. 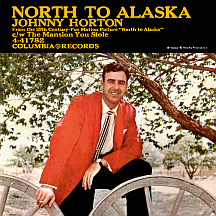 With everyone else focused on wars and famous battles, Johnny Horton took another direction, heading "North to Alaska" to tell a simple love story composed by Mike Phillips, set against the Klondike Gold Rush of the 1890s. The theme for the film of the same title starring John Wayne, Stewart Granger, Fabian and Capucine (released just one month after Wayne's Alamo), it put Johnny back at number one on the country charts and top ten pop at the beginning of 1961. There was one huge problem, though: he wasn't around to enjoy this latest triumph. In early November he had a strange premonition that his death would be caused by a drunk, telling everyone close to him about how strongly he felt it would come true. While driving home to Shreveport (he had a phobia about flying) with Tillman Franks and one other passenger after a November 5 show at the Skyline Club in Austin, Texas, a head-on collision near Milano (about 70 miles to the east) took his life. The two passengers survived and the intoxicated driver of the other vehicle suffered no injuries. But his premonition had come true. Johnny's wife, Billie Jean, became the widow of two great country artists; the Skyline Club in Austin was also the last venue Hank Williams had played before his death several years earlier (you can file that one in your "stranger than fiction" folder). Using the name Billie Jean Horton, she recorded "Ocean of Tears," a song having nothing to do with the deaths of her two famous husbands, yet the title somehow seemed appropriate. It was a minor country hit ten months after Johnny's death. As a teenager in the '70s I was on a Horton kick for awhile. My friends and I would cruise Whittier Boulevard on Saturday nights; a long route, stretching all the way from East Los Angeles to Whittier and back again. The music blasting from everyone's car speakers was the hard rock of the day with a smattering of the disco movement in its early stages. Always the intentional outsider, I preferred to crank up '50s and '60s tunes on my cassette stereo, if nothing more than to see the reactions from the crowds on the street and other drivers. 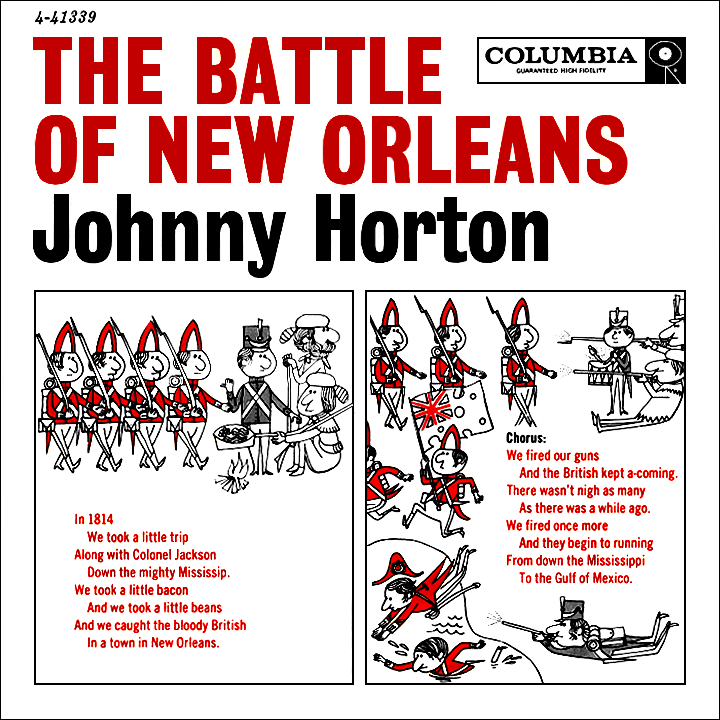 One of our favorites was "The Battle of New Orleans," particularly the song's most graphic segment: 'We fired our cannon 'til the barrel melted down, so we grabbed an alligator and we fought another round...we filled his head with cannonballs and powdered his behind, and when we touched the powder off the gator lost his mind!' The result was a lot of puzzled looks and the occasional thumbs up. 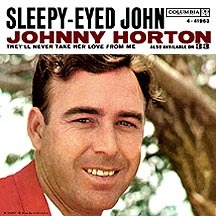 We were just doing our part to keep Johnny Horton's memory alive. His legend continues today.